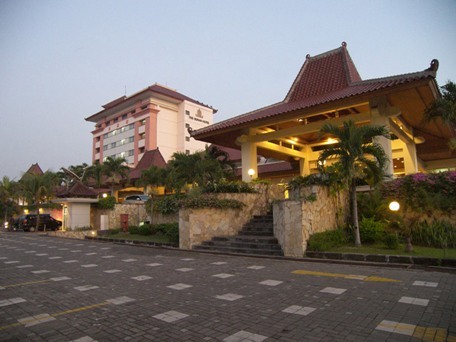 The Sunan Hotel Solo is a four star hotel located in Jl Ahmad Yani 40 Solo, Indonesia. The Sunan Hotel Solo offers a whole range of international standard facilities to business and pleasure travelers. As the host of international events in Solo such as Asia Pacific Ministerial Conference on Housing and Urban Development (APMCHUD), and World Heritage Cities Conference and Expo (WHCCE), it's business facilities, conference and banqueting service are organized with full attention and "extra care". The Sunan Hotel Solo, located at west gate of Surakarta, 4 km away from Keraton Mangkunegaran (Palace), 5 km from the Sunan's Palace or Kraton, 5 km from Government Center, 5 km from the famous shopping area of Pasar Klewer. It's only 15 munites from Adi Sumarmo International Airport and 6 minutes from Balapan Train Station by Taxi. Total number of rooms of the Sunan Hotel are 128, consisting of 1 President Suite, 2 Suite, 8 Junior Sute Rooms, 14 Executive Business Room and 103 Deluxe rooms. Deluxe room, published Rate IDR 938.000/night, consist of 28m2 classic design room. Facing to swimming Pool or city with twin bed and king size. Covered by duvet and a classic furniture and comfort sofa. Equipped bathroom with bathtub or shower, comfort sofa, LCD television with 34 channels, mini bar, water heater and internet connection. Executive business, published rate IDR 1.218.000/night. Junior Suite, published rate IDR 2.188.000/night. consist of 54m2 room with private living room, guest room and bedroom. Suite, published rate 3.408.000/night, consist of 84m2 room with private-luxury living room, guest room, dining table, bar counter and bed room. President suite, published rate IDR 5.788.000/night, consist of 112m2 luxury living room, guest room, dining table, bar counter and 2 bed rooms. The Sunan Hotel Solo, deluxe room, published rate 938.000/night, our very discounted price IDR. 550.000/night breakfast included. Book here to get the discounted price!